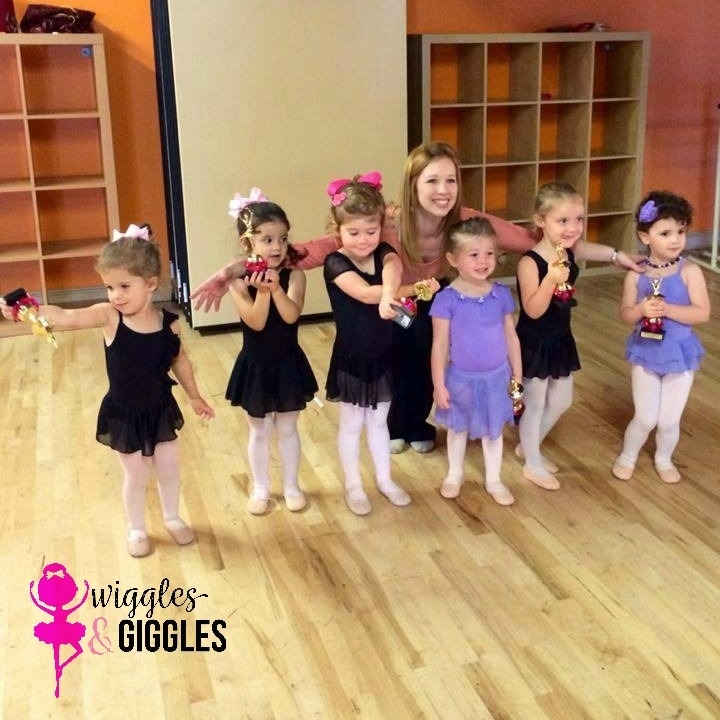 Our 3-6 yr old program, where wiggling and giggling is what we're all about! Dancers will receive t-shirt upon fall registration. This program offers ballet, tap and tumbling classes, performs twice a year (Dec. and June) and has 1 month curriculum units, including rhythm, balance, teamwork, creativity, etc. Dancers will receive a TDM Academy t-shirt upon fall registration, as well as earn 4 pins throughout the year in each of their classes. These dance pins can be added to their dance bags and will reflect the curriculum the class is learning. We believe in recognizing the dancer's progress and achievements in this way. The Academy also offers 3 optional fun events, from popcorn recital DVD watching parties to Christmas parades. Teaches beginning dancers the basics in motor skills, coordination, balance, etc. Moms are in the classroom with students which includes 30 minutes ballet and 15 minutes tumbling on gymnastics mats. Comfortable clothing for mom; any color leotard and tights for child plus ballet shoes. Dedicated to learning basic motor skills, coordination, balance, and rhythm. Our number one goal is to make your little dancer love to come to ballet! Any color leotard, any color tights, pink ballet shoes, slip-on or attached skirt optional. No tutus. Pre-ballet is dedicated to learning basic motor skills, coordination, balance and rhythm. Our number one goal is to make your little dancer love to come to ballet! Class also includes 15 min. of tumbling on gymnastic mats. This combination class is geared at teaching the student ballet technique to build strength and coordination and rhythm through tap dance. Ages 4 - 6: any color leotard, any color tights, pink ballet shoes and black tap shoes, hair secured away from face, skirts allowed. Ages 6 - 8: black leotard, pink tights, pink ballet shoes, hair in bun or secured away from face, add black tap shoes. Tap is a fun and exciting way to learn rhythm skills and coordination through upbeat music. Comfortable athletic wear/dancewear, black tap shoes that lace up (not Mary Jane style), hair secured away from face. No jeans. Ballet class teaches the student technique through barre exercises, locomotor skills across floor, and centre work to aid in the dancer's development. Teaches grace and emphasizes flexibility. Ballet is recommended to be a part of every student's dance training. For students taking ballet 2X a week or more, there are more performance opportunities, such as dancing with the Moscow Ballet in "The Nutcracker," performing at Dance for the Planet, and testing in the Cecchetti Ballet Method and earning certification. Black leotard, pink tights, pink ballet shoes, wrap or slip on skirt optional. Hair in bun or secured away from face. Incorporates some of our students' favorite music while learning jazz technique, that ranges from musical theatre, to hip-hop, to lyrical. Any color leotard, any color jazz pants/capris/booty shorts, tan jazz shoes with no laces (get slip ons), hair secured away from face. Okay to wear form-fitted tank top over leo. No baggy T-shirts or sweats. Uses free-style movement and is based on the latest styles, while incorporating jazz technique. Any movable athletic wear, sneakers, no short loose shorts or booty shorts. Hair secured away from face. Offers training in the three main areas of musical theatre: jazz dance, acting, and voice. A great class for those upcoming stars thinking about or already involved in the theatre. Any color leotard, any color jazz pants/capris/booty shorts, tan jazz shoes (slip ons, not lace up), hair secured away from face. Okay to also wear form-fitted tank top over leo. A blend of graceful ballet with jazz moves set to slower ballads. Class increases strength and flexibility as movement is slower and controlled. A solid training in ballet is needed. Any color leotard, any color jazz pants/capris/booty shorts, okay to wear form-fitted tank top over leotard, lyrical foot-undies or barefoot, hair secured away from face. No T-shirts or baggy clothes. This fun team is a non-audition group. If you want to be a part of it, just sign up! Pom Squad learns pom routines in jazz, military jazz, and hip hop styles and performs locally 4 times throughout the school year. Each performance debuts a new dance: so if you like to learn and master new choreography, this class is for you! Also great if you are interested in cheer or drill team in the future. Comfortable athletic wear. Tan jazz shoes (no laces) and Pom Squad uniform will be worn at all performances. Find a day and time that works for you. View schedule here.